Sealed tenders are invited from the reputed firms / companies registered with tax department for Supply of Electrical Material and Inverter AC Split Type 1.5 Ton Capacity. Detail specifications are available in tender documents. Tender documents may be collected from Account Section from the college on cash payment of Rs. 500/- each tender (Nonrefundable). Sealed Technical & Financial Proposal in accordance with PPRA Rule -2014 clause 36 (b) “Single stage two envelops bidding procedure” are invited from reputed tax registered firms/companies for Supply of Sound Related Equipment’s for Musicology Department, Supply of Photography Equipment’s, Supply of Branded Computers and Supply of 5 Kva Inverter UPS & Dry Batteries. Sealed Technical & Financial Proposal in accordance with PPRA Rule-2014 clause 36 (b) “Single stage two envelops bidding procedure” are invited for hiring of building for hostel accommodation for 40 students located in and around NCA Lahore within ½ KM radius on Quarterly Rental Basis. Tender documents may be dropped in Tender Box placed in Purchase Office at 11:00 AM dated 25-03-2019 along with 3% earnest money in favor of Principal – NCA. Sealed Technical & Financial Proposal in accordance with PPRA Rule-2014 clause 36 (b) “Single stage two envelops bidding procedure” are invited for “Running of NCA Lahore Campus Cafeteria” and “Running of NCA Lahore Hostel Mess” from the reputed firms/companies registered with tax and Punjab food Authority departments. Sealed tenders are invited from the reputed firms/companies registered with tax department for supplies of Stationary Items, General Store Items, Tonner & Cartridge, USB Items and LED bulbs. The proposals will be opened by the College Purchase Committee as per mentioned schedule in the presence of interested contractors. Sealed tenders are invited for supply of Dry Batteries (12V200Ah) from the reputed firms/companies registered with sale tax department for said work. Detail specifications are available in tender’s document. Tenders documents may be dropped in Tender Box placed in Purchase Office on 24.09.2018 at 11:00 AM along with 2% earnest money in favour of Principal-NCA. are requested to visit NCA hostel at Sanda Road Lahore. tender box place in the office of Chairman Auction Committee on 18.09.2018 at 11:15 AM. from reputed tax registered firms/companies for supply of branded computers. Detail specifications are available in tender document. may be dropped in tender box placed in purchase office on 23.05.2018 at 11:00 AM along with earnest money amount in favour of Principal NCA. reputed registered security agencies/firms/companies. Detail specifications are available in tender documents. on 05-10-2017 at 11:00 AM along with 2% earnest money in favor of Principal NCA. Sealed Technical & Financial Proposal in accordance with PPRA Rule-2014 clause 36 (b) “Single stage two envelops bidding procedure” are invited for running of NCA Lahore Campus & Hostels Cafeteria from the reputed firms/companies registered with tax and Punjab food Authority departments. The detail specifications are available in tender documents. Tender documents may be collected from Account Section from the college on cash payment of Rs. 1000/- (non refundable) as a tender document fee. Sealed Technical & Financial Proposal in accordance with PPRA Rule-2014 clause 36 (b) “Single stage two envelops bidding procedure” are invited from reputed tax registered firms/companies for supply of computers. Detail specifications are available in tender documents. Tender documents may be collected from Account Section from the college on cash payment of Rs. 1000/- (nonrefundable) as a tender document fee. Sealed tenders are invited from the reputed firms/companies registered with sale tax department for supplies of wooden beds and foam mattress. Detail specifications are available in tender documents. Tender documents may be collected from Account Section from the college on cash payment of Rs. 500/- each (nonrefundable) as a tender document fee. Sealed tenders are invited from reputed firms/companies registered with sale tax department for supplies of Energy Saver Ceiling Fans. each (nonrefundable) as a tender document fee. Sealed tenders are invited from the reputed firms/companies registered with sale tax department for supplies of General Store items. Detail specifications are available in tender documents. Tender documents may be collected from account section from the college on cash payment of Rs. 500/- (nonrefundable) as a tender document fee. Sealed Technical & Financial Proposal in accordance with PPRA Rule-2014 clause 36(b) “Single stage two envelops bidding procedure” are invited from reputed printing firms/ companies which have their own setup of printing under one roof for printing of catalogue/coffee table book at National College of Arts Lahore Campus. Detail specifications are available in tender documents. Sealed tenders are invited from the reputed computers firms/companies registered with sale tax department for supplies of Computers, Laptop & LED. Detail specifications are available in tender documents. Tender documents may be collected from Account Section from the college on cash payment of Rs. 1000/- each (nonrefundable) as a tender document fee.Tenders documents may be dropped in tender box placed in purchase office on 14.11.2016 at 11:00 AM along with 2% earnest money in favor of Principal-NCA. This is with the reference to the tender notice no 53/2016 for Purchase of Wood Work Machinery, published at PPRA, college website and Daily News Paper dated 27/09/2016. 1.Date of submission of bid and opening of tender is extended to 17th of October, 2016 instead of 12th,October 2016. 2.Timing and other terms and conditions will be remain same as per tender documents. Sealed tenders are invited from the reputed firms/companies registered with sale tax Department for supplies of Ceiling Fans & Electrical Material. Detail specifications are available in tender documents. Tender documents may be collected from Account Section from the college on cash payment of Rs. 500/- each (non refundable) As a tender document fee. Sealed tenders are invited from the reputed firms/companies registered with e tax department for Repair & Refurbishment of Textile department building. Tender documents may be collected from Estate Department from the college on cash payment of Rs. 1000/- (non refundable) as a tender document fee. Sealed tenders are invited from the reputed firms/companies registered with sale tax department for supplies of following items. each (non refundable) as a tender document fee. detail specifications are available in tender documents. Tenders documents may be dropped in tender box placed in chairman canteen committee office on 10/10/2016 at 2:00 PM along with 2% earnest money in favour Of Principal-NCA. Sealed tenders are invited for supply of Dry Batteries (Cyber Power 200Ah) from the reputed firms/companies registered with sale tax department For said work. Detail specifications are available in tender’s document.Tenders documents may be dropped in Tender Box placed in Purchase Office on 26.09.2016 at 10:30 AM. Sealed technical and financial proposal in accordance with PPRA Rules- 2014 clause 36-b “Single stage two envelop beading procedure” are Invited for supply and installation of Solar System at National College of Arts Lahore from reputed firms and companies registered with tax Departments. Sealed tenders are invited for Civil work including supply of electric material from the reputed firms/companies registered with sale tax department for supplies/works for above mentioned categories, the detail specifications are available in tender documents. 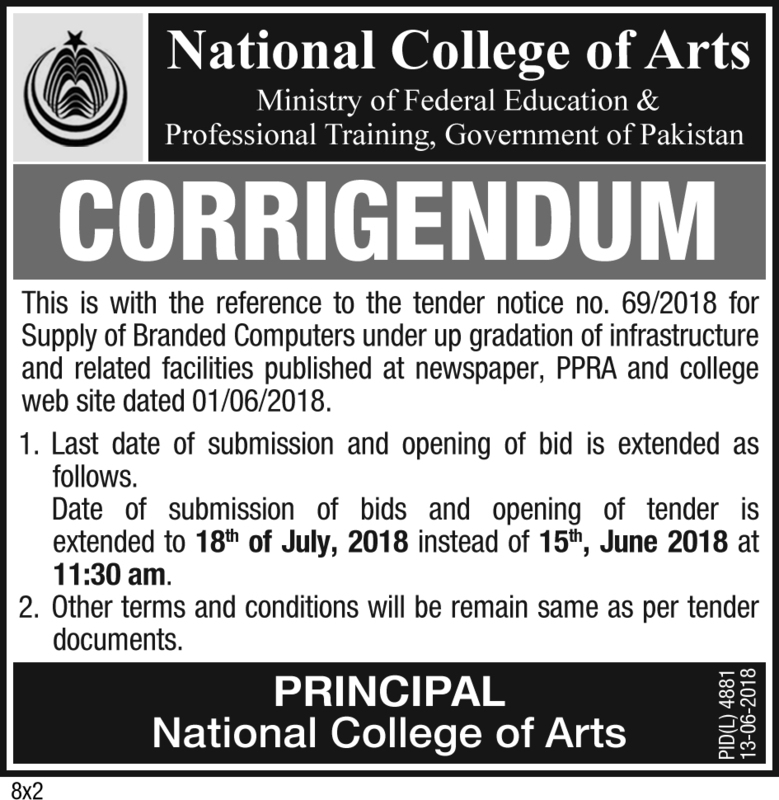 Sealed Technical & Financial Proposal in accordance with PPRA Rule-2014 clause 36 (b) "Single stage two envelops bidding procedure" are invited for running of NCA Cafeterias, from the reputed firms/companies registered with tax and Punjab food Authority departments for running of NCA College Cafeteria and NCA Hostel Mess, the detail specifications are available in tender documents. Sealed Technical & Financial Proposal in accordance with PPRA Rule-2014 clause 36 (b) “Single stage two envelops bidding procedure” are invited from reputed Printing firms/Companies. Sealed tenders are invited from the reputed firms/companies registered with sale tax department for supplies of Air Conditioner. Sealed tenders for “Civil Work for Security Strengthening work” are invited From reputed firms/companies registered with sale tax department for supplies/Works. Sealed tender for Fabrication of Steel Lockers are invited from reputed Fabrication firms/Companies. Sealed tenders are invited for supply of Biometric Finger Print from the reputed firms/companies registered with sale tax department for said work. Tenders for supply of furniture & home appliances are invited from reputed sale tax registered firms/companies. Tenders for supply of branded computers are invited from reputed tax registered firms/companies. Tenders for repairing of lift are invited from reputed firms/companies. Tenders for civils work at NCA college & hostal are invited from reputed firms/companies. Tenders for supply of machinery for product and furniture design department are invited from reputed firms/companies. Tenders for bus body repairing and complete engine overhauling of hino bus are invited from reputed firms/companies. Tenders for supply of machinery for wood work and furniture design department are invited from reputed firms/companies. Tenders for printing of college prospectous are invited from reputed firms/companies. Tenders for supply of branded computers, laptops and UPS are invited from reputed firms/companies. Tenders for supply of photography equipments are invited from reputed firms/companies. Tenders for supply of inverter air conditioner are invited from pre-qualified firms. Tenders for multimedia projectors are invited from reputed firms/companies. Tenders for purchase of stationery and general store items are invited from pre-qualified firms. Tenders for Installation of Deepwell Pump are invited from pre-qualified firms/companies. Tenders for non branded computers are required.